From early indications, it certainly looks like the Liberal Party senators and Senate allies of Noynoy don’t have the numbers to convict Ombudsman Merceditas “Merci” Gutierrez, which is why Sen. Teofisto “TG” Guingona and the LP senators came up with the partial report on the plea bargain deal just when the House is set for a plenary vote, which speaks of a psy-war effort to make it appear that they had the numbers to convict — 14 at the latest count, which would not have been too far off from getting two more senators to their side, the end game being for Merci to resign instead of facing an impeachment court. Some type of power play seems to be in the works within the Supreme Court (SC), with one faction pitting itself against another faction, in a bid to destroy the justices who do not toe Noynoy line, with perhaps the end result of the majority of justices being impeached, as the other faction takes on the high posts in the high court, along with a new set of justices who will now be at the beck and call of the appointing power: Noynoy. This was fairly evident after SC Chief Justice Renato Corona tackled the “controversial” matter of the SC majority issuing a status quo ante (SQA) order --- or a TRO, for better layman’s understanding --- preventing the House committee on justice from holding hearings on the impeachment complaint against Ombudsman Merceditas Gutierrez last September. It appears, from the SC rules, that the chief justice, or for that matter, any high court justice, on his own, is empowered to issue a TRO, subject to affirmation of the en banc when justices meet. WASHINGTON — America’s top spy warned Thursday that Moamer Kadhafi’s forces would “prevail,” even as the Obama government reached out to the Libyan opposition with direct talks and humanitarian aid. US President Barack Obama was set to hold a press conference at 1615 GMT Friday to address issues such as rising oil prices as the world heaps pressure on Kadhafi and grapples for a response to the fighting on the ground. Secretary of State Hillary Clinton, who will travel to the Middle East next week and meet senior anti-Kadhafi figures, said a plan aimed at establishing a no-fly zone over Libya will be presented to Nato on Tuesday. MANILA — Immediately in the wake of announcements that at least 6,000 American troops will be arriving in the Philippines to participate in the Balikatan joint military exercises, an alliance of peasant groups and their supporters from ecumenical formations declared their opposition. The farmers groups said that the presence of more military forces in the areas where the exercises will be held is certain to result in more human-rights violations against civilians. 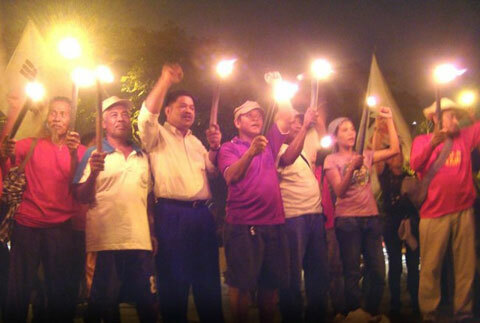 They also said that farmers will be facing renewed threats of eviction. The public affairs officer of the Balikatan exercises representing the Philippines, Maj. Enrico Gil Ileto, recently announced that the American troops will join 2,000 Filipino soldiers in a series of exercises beginning April 10. For the next 10 days, the combined forces will hold exercises at the headquarters of the Armed Forces of the Philippines’ (AFP) Western Command (WESCOM) in Puerto Princesa in Palawan. Field training exercises will be held in various training sites, namely in the Fort Magsaysay Military Reservation (FMMR), the headquarters of the Army’s 7th Infantry Division and Special Operations Command in Nueva Ecija; Basa Air Base and Clark Air Base, both in Pampanga; Crow Valley Range in Tarlac; Naval Station L. Gantioqui in Zambales; Sangley Point in Cavite City; Marine Base Ternate in Cavite; and in Mactan Air Base in Lapu-Lapu City. MANILA – A labor leader was shot dead by two unidentified assailants at around 10 p.m. on March 8 along Governor’s Drive in Langkaan village, Dasmarinas, Cavite, according to the Workers Assistance Center Inc. (WAC). Celito Baccay, 31, a key leader and organizer of the union in Maeno Giken, a Japanese-owned manufacturer of steel, iron and stainless steel products, is the 41st victim of extrajudicial killings under the Aquino administration. 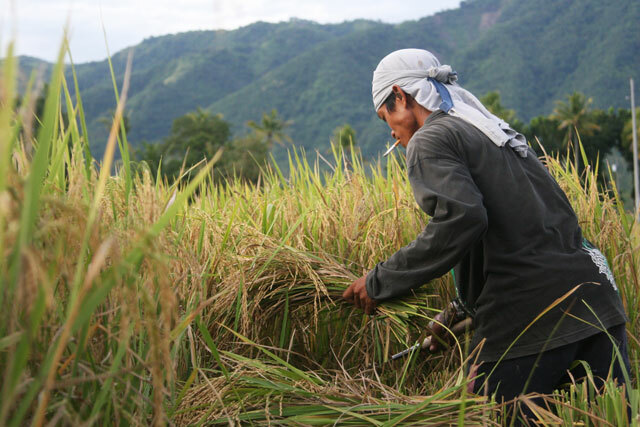 MANILA – The rice industry is in peril as production of the staple food in the Philippines has been declining in the last two years, an agriculturalist said in a recently released report. Finesa Cosico, an agriculturist and member of Agham (Advocates of Science and Technology for the People), cited figures from the Bureau of Agricultural Statistics showing that corn and rice production contracted last year. Based on data from the bureau, from producing as much as 16.8 million metric tons (MT) of rice in 2008, the country only had a production of around 15.8 million metric tons production in 2010. The same decrease in production happened to corn crop output in 2010. Total corn production went down by 9.34 percent from 7.0 million metric tons in 2009, to only 6.3 million metric tons last year. Cosico said that there was a host of reasons that are cited for the drop in crop output. MANILA – Finding no justice here in the Philippines, families of five slain journalists in Mindanao have filed complaints against the Philippine government before the United Nations Human Rights Committee (UNHRC). The five journalists were killed in separate instances across a time span of eight years, from 2000 to 2008. No one has been convicted for these murders. MANILA — The New People’s Army (NPA) blamed the military for the murder of botanist Leonard Co and two others and denied that there was an encounter. Co, Sofronio Cortez and Julius Borromeo, were killed inside the Energy Development Corporation (EDC) complex in Kananga, Leyte, on November 15, 2010. They were part of a team conducting a research for the EDC. .In a statement sent through email, the Mt. Amandewin Command of the NPA-Leyte denied any responsibility and said that what happened on November 15, 2010, was a plain massacre by the 19th IB. As good as soiled toilet paper and just as useless, is Senate blue ribbon committee chairman Teofisto “TG” Guingona’s “partial report,” or so it seems. The Senate’s partial report enjoining the House of Representatives to impeach Ombudsman Merceditas Gutierrez does not carry the unqualified vote of the majority of the members even if it has been already signed by 14 senators, which makes the committee report invalid. TOKYO — A massive 8.9-magnitude earthquake hit northeast Japan yesterday, setting a nuclear plant ablaze, unleashing a 10-meter tsunami that tossed ships inland and leaving at least 60 persons reported dead and 56 others missing. Police in Iwate prefecture, near the epicenter, confirmed the deaths of 17 persons there. It was the strongest earthquake ever to hit Japan. Police said many others were injured in Tokyo and coastal areas of the main Honshu island while television footage showed scenes of utter devastation and flooding. A monster 10-meter tsunami wave hit near Sendai City where a tide of black water sent shipping containers, cars and debris crashing through streets and across open farmland, destroying everything in its path. The government yesterday raised the tsunami alert in at least 19 provinces on the country’s eastern coast following a magnitude 8.9 earthquake off Japan. According to the National Disaster Risk Reduction and Management Council (NDRRMC), the tsunami alert was raised around 2 p.m. and immediately relayed to local government units (LGUs) and other government agencies in the eastern seaboard of the country. Among the provinces alerted were Batanes Islands, Cagayan, Ilocos Norte, Isabela, Quezon, Aurora, Camarines Norte, Camarines Sur, Albay, Catanduanes, Sorsogon, Northern Samar, Eastern Samar, Leyte, Northern Leyte, Surigao del Norte, Surigao del Sur, Davao Oriental and Davao del Sur. Malacañang has formally issued a show-cause order against Special Prosecutor Wendell Sulit but has referred the case of her assistants and deputies to the Civil Service Commission (CSC) in line with the complaint filed by the House committee on justice for their involvement in the questionable plea bargaining agreement with retired Maj. Gen. Carlos Garcia. In a statement released by Executive Secretary Paquito Ochoa Jr.’s office, Sulit is being asked to provide explanation why she and her co-accused should not be sanctioned for getting themselves involved in such a controversial act. The initiation of administrative proceedings is based on the recommendations of the House committee on justice headed by Iloilo Rep. Neil Tupas Jr. upon conducting an investigation into the alleged anomalous plea bargain agreement. Presidential spokesman Edwin Lacierda yesterday implied that Supreme Court Chief Justice Renato Corona is being perceived by the Filipinos as “petty and paranoid” over claims that there are “politicians forcing the justices to play their game,” while subverting democratic processes, and bringing down the institution of the SC. Lacierda put yet another spin on the remarks of the SC chief, challenging the SC chief to be specific on his allegations of a “concerted effort” from the presidential allies to bring the high tribunal down, otherwise he will be perceived as petty and paranoid. Marine Capt. Nicanor Faeldon yesterday filed his amnesty application before the Department of National Defense-Amnesty Committee (DND-AC) as he vowed to continue his anti-corruption advocacy even after his military career. Faeldon formally filed his amnesty application before the DND-AC, headed by Defense Undersecretary Honorio Azcueta, along with Lt. Edwin Duwitao. Faeldon, however, maintained that his application for amnesty will not stop his campaign against corruption, not only in the Armed Forces of the Philippines (AFP) but in the entire society. He said he applied for amnesty to effectively pursue his advocacy against corruption. ILAGAN, Isabela – As she is being considered to be given a top post in the national government, former Isabela Gov. Grace Padaca appears to be in danger of losing it as she would be facing malversation case filed against her and three others in connection with alleged illegal disbursement of about P25 million public funds to a private foundation.